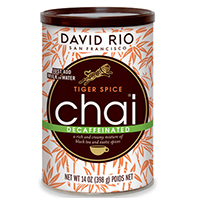 David Rio’s decaffeinated Tiger Spice Chai is a delicious mixture of spices, honey, and decaffeinated black tea. The exotic spices are the perfect complement to the full, rich flavor of the tea. 1) Pour 7oz of hot milk or water over 2 heaping tablespoons of chai (add more or less chai to taste). 1) Combine 2 heaping tablespoons of chai with 2oz hot milk or water. 2) Pour over a cup of ice. 3) Add another ½ cup or milk or water and stir.